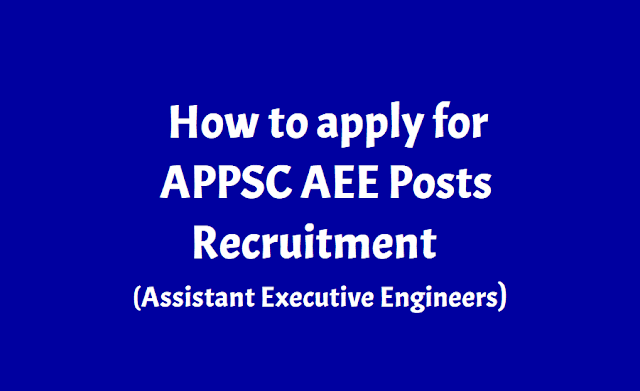 How to apply for APPSC AEE/Assistant Executive Engineers 2019 Recruitment: APPSC AEE/Assistant Executive Engineers 2019 Recruitment Online application form, Step by step online applying procedure, Online application form filling instructions, Fee Payment Mode details given here. APPSC has issued a notification for filling up 309 Assistant Executive Engineer posts and applications are invited Online from qualified candidates through the proforma Application to be made available on Commission’s WEBSITE (www.psc.gov.in) to the post of Assistant Executive Engineers in Various Engineering Services in the State of Andhra Pradesh. APPSC AEE notification 2018-19 released @ psc.ap.gov.in, application to begin on December 3: The Andhra Pradesh Public Service Commission (APPSC) has released AEE recruitment notifications on November 29, 2018. Applications are invited online for recruitment to the post of Assistant Executive Engineers in various Engineering Services for a total of 309 vacancies. The notification will be made available on the official website of the APPSC. The application process for the recruitment will begin on December 3, 2018. The candidates who wish to apply for the AEE posts can visit the official website - https://psc.ap.gov.in - to submit their application form online. The last date for payment of fee is December 23, 2018. To apply for the post, the candidate should must be within the age group of 18 - 42 years as on 01.07.2018. If selected, the candidates get a pay scale of Rs 37,100 - 91,450. As per the notification, "Before applying for the post, an applicant shall register his/her bio-data particulars through One Time Profile Registration (OTPR) on the Commission’s website - https://psc.ap.gov.in. Once applicant registers his/her particulars, a user ID is generated and sent to his/her registered mobile number and email ID. Applicants need to apply for the post using the OTPR user ID through Commission’s website." If, the number of candidates exceeds 25,000, the Commission will conduct an offline screening test. Candidates selected in screening test will be eligible for main examination that will be held in online mode through computer based test on 01/04/2019 FN & AN, 02/04/2019 FN & AN. The applicant has to fill the OTPR application to obtain ID Number. While filling the same, the candidates have to ensure that there are no mistakes in it. The Commission bears no responsibility for the mistakes, if any, made by the candidates. Once the Application Fee ID is generated, select the payment of Fee option for paying through either Net banking / Credit Card / Debit Card OR APOnline Centre. particulars furnished by the applicant. The Application Fee ID No in the PDF Application form has to be quoted for future reference/correspondence. i) Applicant shall note that, the details available with OTPR database at the time of submitting the application will be considered for the purpose of this notification. If, any changes are made by the applicant to OTPR database at a later date will not be considered for the purpose of this Notification. 1. The Commission is not responsible, for any omissions by the applicant in bio-data particulars while submitting the application form On-Line. The applicants are therefore, advised to strictly follow the instructions given in the User guide before submitting the application. 2. The particulars furnished by the applicant in the Application Form will be taken as final, and data entry processed, based on these particulars only by Computer. Candidates should, therefore, be very careful in Uploading / Submitting the Application Form Online. THE INFORMATION IF ANY FURNISHED BY THE CANDIDATE SUBSEQUENTLY WILL NOT BE ENTERTAINED BY THE COMMISSION UNDER ANY CIRCUMSTANCES. SUBMISSION. IF ANY LAPSE IS DETECTED DURING THE SCRUTINY, THE CANDIDATURE WILL BE REJECTED EVEN THOUGH HE/SHE COMES TO THE FINAL STAGE OF RECRUITMENT PROCESS OR EVEN AT A LATER STAGE. FORM SHOULD BE LEFT BLANK; OTHERWISE APPLICATION FORM WILL NOT BE ACCEPTED. c) Un-employed youth in the age group of 18 to 40* years as per G.O.Ms.No. 439, G.A. (Ser.A) Dept., dated: 18/10/1996 should submit declaration at an appropriate time to the Commission. i) The Fee mentioned in the above paragraph is to be paid online through two different channels viz., (i) Online using Payment Gateway using Net Banking/ Credit card / Debit Card and (ii) AP Online Centers.. The list of Banks providing service for the purpose of online remittance of Fee will be appended separately. Iii) IPO’s / Demand Draft are not accepted. 3. Hall Tickets can be downloaded 07 days before commencement of Examination. : Hall Tickets can be downloaded whenever the Commission uploads them to its website. Intimation would be given through the website regarding downloading of Hall Tickets.